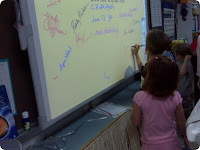 The coolest part was the "black board" the kids have these days. It is completely digital. Liam rolled up on it, whipped out a digital pen, and started writing on the "screen." Different colors. Different brushes. Different sizes and shapes tips for the pens. Not only was it real-time for the kids, but the teacher could see it on her desktop. She could update it from there, as well. It was nicer and more complex than anything we have at work. And the kids took to it like fish to water. Then we stopped by Meg's class. She has the same teacher Liam did. Sits almost the same place he did. A great teacher and she's glad to have Meg in there. No digital blackboards in there. But we're talking about First Grade. They don't get the new digital hotness until Third Grade. Afterward, we swung by the new councilor's room. Cindy made introductions and we actually had a grownup conversation for a while. 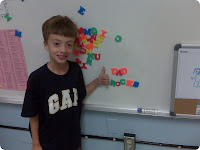 In the interlude, the kids stalked up to the councilor's board and re-arranged the magnets they found there. Thankfully, my kids are young. Were they teenagers, I'm scared to think what they may have written. As it stands now: Dad Rocks. 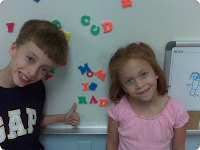 And while they are in their formative years, my kids think: Mom Is Rad. I do try to cherish these moments while they last. The more the merrier, I says.